Work on the BOH Deluxe package continues. 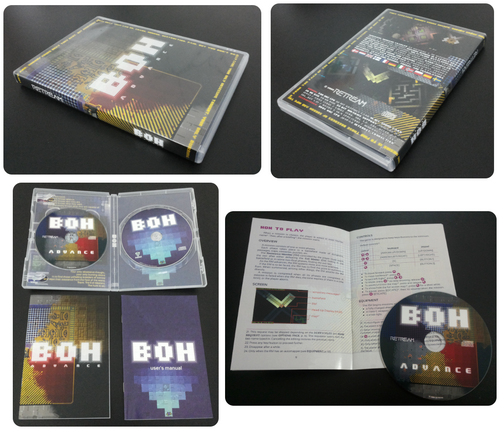 The alternative package shown in the image has been produced in 10 copies (not for sale). The BOH Deluxe package will consist of a cool sleeve wrapping a copy of the original BOH and a copy of BOH ADVANCE (the latter being a single-disc and even better looking version of the box in the image). The aim is to have the package sell at the lowest price possible for the maximum quality/price ratio. Updates will follow. To stay tuned, keep an eye on the RETREAM page on Facebook, where you can also see higher resolution pictures in the BOH album.